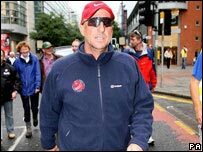 Former Somerset cricketer Ian Botham walked through Bristol on Sunday as part of his latest fund-raising effort for charity. Botham is currently trekking through 17 cities, covering 170 miles in less than nine days. He is raising funds for two charities, Leukaemia Research and the Teenage Cancer Trust. In Bristol the route took in the city centre, Durdham Down, Horfield, Ashley Down and Montpelier. He was accompanied by Somerset cricketer Marcus Trescothick on Sunday's leg of the walk before heading off to Southampton for the next section.